It’s tempting to add hatches, sockets, ladders and racks on the outside of the van to provide better access to utilities and to provide places to strap stuff on. The problem is, every hole and every screw or bolt is another place where you’ve breached the protective paint layer, so it’s an opportunity for the van to rust. Rust is an inevitability with vehicles. Even if you religiously wax and polish the parts you can see, the parts you can’t see will be succumbing to metal cancer. What you can do to slow this process down is make sure you don’t give the rust a head start. That means cleaning and priming any holes you make in the van, and sealing up around any items you bolt on. 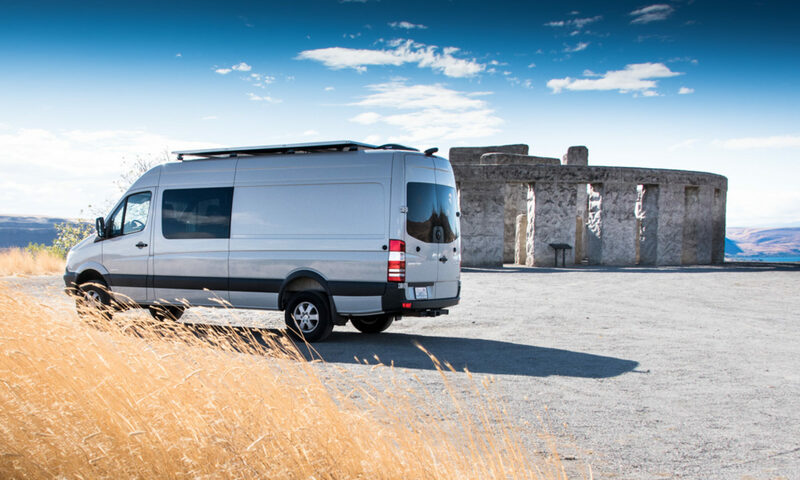 Take a look at any of the RV offerings from the commercial vendors like Winnebago. Even their Class B vehicles (built using the original vehicle, rather than a modified box on the chassis) have plenty of additional flaps, openings, outlets and vents added in to the van’s metal. Apart from looking ugly (flat panels on a curved surface), these aftermarket additions are an invitation to rust. A typical “commercial” conversion. Nine separate flaps and hatches on this side of the van. Several more on the other side. Most of the covers are plastic. They may or may not be sealed behind. The holes made in the metal may or may not have been treated with rust preventative primer. RV manufacturers need to keep costs down and they work on a tight timescale. Waiting for primer to dry may not be part of that timescale. The van will look good enough for long enough that it will sell. After that, it’s easy for the RV manufacturer to blame Mercedes, and for Mercedes to blame the RV manufacturer for long enough that you give up trying to get them to fix the rust bubbles that form later. Rust is what happens to steel when it’s exposed to oxygen and water. The result is hydrated iron oxide. If you live in a salty environment (near the sea, or where roads are treated for ice in winter) that will speed up the process. Car manufacturers try to slow this reaction down by coating the steel with zinc, paint, rubber undercoating, and various waxes. Each of these work in different ways. The zinc is sacrificial. It is more reactive than iron/steel, so it “steals” the oxygen and water to create zinc oxides before they can react with the steel. That’s great while the zinc lasts. However, once it’s been used up the steel underneath can start rusting too. Only a couple of areas of the van body that are highly susceptible to chips (like the engine hood) have a solid zinc treatment. Paint is a barrier. It forms a layer that prevents oxygen and water from getting to the steel. If there is a physical barrier, the elements can’t mix and rust can’t form. Rubber undercoating is protective. It helps prevent the paint layer from being compromised (chipped). Because it absorbs shock, things like pebbles thrown up from the road bounce off it rather than chipping it away. Wax (the sticky yellow stuff you’ll find inside some body cavities and under the vehicle) works partly like paint (barrier layer) and partly like the rubber undercoating (protective layer). Over time, all of these layers will fail. But in combination and with some regular cleaning and maintenance you can expect many years of protection. Of course, any time you cut holes through the van metal or screw or bolt something through it, you are removing all the protection that the paint, wax zinc, and undercoating might provide. Cutting and drilling holes leaves bare metal edges. Inserting self-tapping screws does the same thing. That bare metal can and will react with any moisture in the air to create rust. Notice the rust bubbles where the screws enter the van metal. The stainless screws haven’t noticeably rusted, but the sheet metal they are attached to has. What’s more, the shavings of metal from the cutting and drilling will also react. Some oxides of iron react differently with paint. 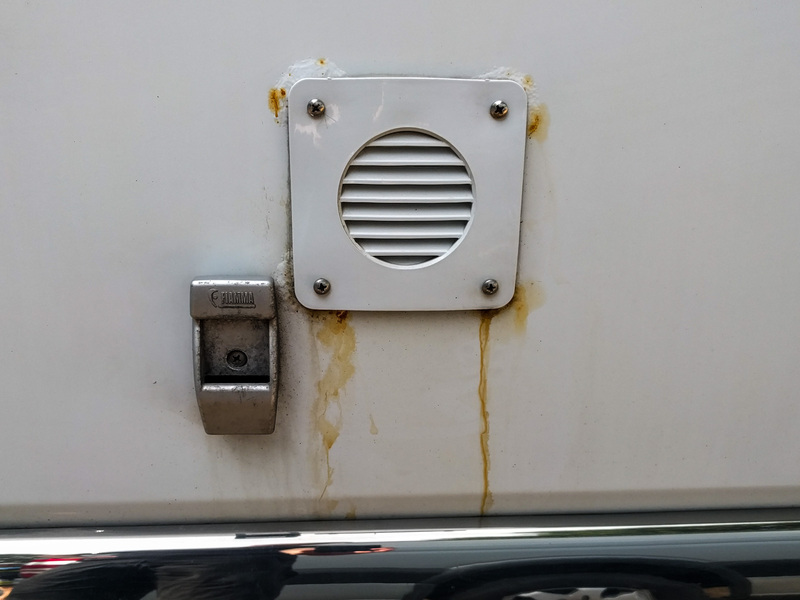 If you let the shavings stay inside the panels of the van, then once the shavings have started rusting, they can damage the paint around them. Once that paint is damaged, the metal underneath it can rust too. The best way to stop rust is to not give it a chance to start. That means not adding items to the outside of the vehicle. Of course, that’s not entirely practical. If you want a fan vent, or a way for solar panel wires to enter the vehicle, or an exhaust for your diesel heater, then you’ll be making holes. But do you really need to bolt additional stuff on the outside? Minimizing your holes minimizes the chances of rust. Assuming you are going to make some holes, do it in a sensible way. Catch as many metal shavings as you can. Tape off the area you’re cutting in, vacuum up afterwards, and even run a magnet around to pick up stray filings. Deburr the edge of the hole. This ensures a smooth edge and a close fit for whatever is going in the hole. It also lets the paint you’re going to apply adhere better. Use a clay bar on the metal around the hole you cut. This picks up even the most microscopic pieces of metal and prevents them from becoming rust spots later. It’s a common tool used by detailers to remove stubborn dirt and pitch from paint too, so it’s useful to have around. Mask and spray a couple of coats of good quality rust preventative primer over the cut area, extending past this area on to the existing painted area. Make sure to do this on both sides of the cut metal. For holes drilled into a cavity, use a q-tip or similar to wipe primer onto the side of the metal sheet that you can’t see. Wait for this primer to dry properly before you go any further. In some areas we even painted on POR15, which is an awesome rust preventative coating (that link is to small tins on Amazon – the paint is so strong that once you’ve opened the tin, it will glue itself closed again, so small tins are better than one big one). Use attachment methods that don’t cut into the van metal. For instance, self-drilling and self-tapping screws will cut through any paint. Rivnuts/plusnuts, rivets, and bolts will be less likely to do this after you’ve primed the hole they fit into. There are also some pretty amazing glues out there that might mean you don’t even need to make a hole in the first place. Use fasteners that won’t promote galvanic corrosion. Aluminum and steel are a bad combination. Stainless steel is a better choice here, although there’s still a chance for galvanic corrosion to occur. Seal around the outside of the items you add. A couple of specific sealants used in the RV industry are Dicor and Sikaflex. Dicor is designed to flow and then form a flexible barrier. Sikaflex is an adhesive and a sealant that can be used on vertical as well as horizontal surfaces. 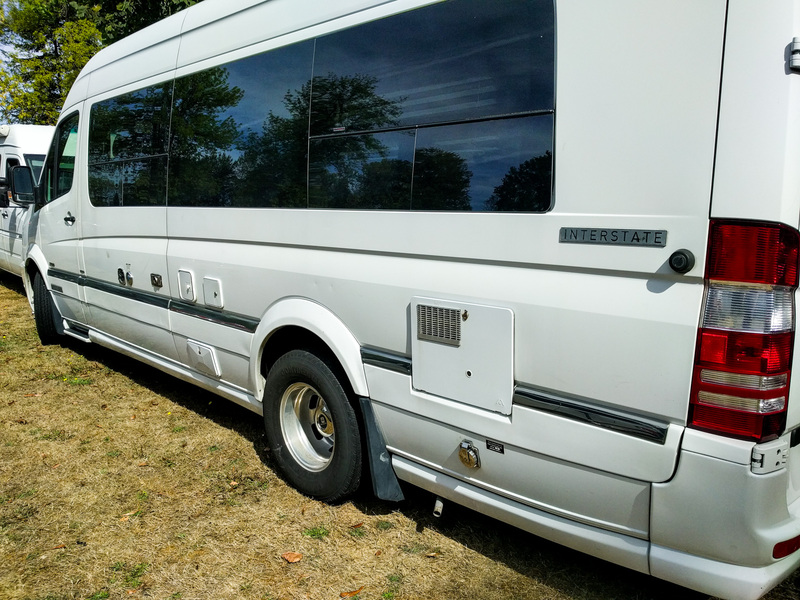 Cutting holes in your brand new van is a right of passage for any conversion, but do it right, clean, prime and seal the holes you make, and don’t give rust a chance to take hold. Good points. It’s also important to check the outside of the van from rock damage that can lead to rust. After washing my van after a trip to Alaska, I noticed a 7mm red spot on the upper side of my Sprinter. I quickly sanded off the rust and primed it with the same oil-based Rust-Oleum I used to prime the holes drilled for Rivnuts. Then I ordered a Graphite Gray Metallic color-matched paint pens and aerosol cans from AutomotiveTouchup to cover that and other rock damage. I carefully inspected the whole 22 foot van and found a number of places where tiny rock chips were starting to rust. While the hood and lower sideboards have the zinc and/or rubber coating to prevent rust, the upper panels of the van don’t so they are the most important to check carefully. The area above the windshield had a number of 1mm to 3mm rock chips that were starting to rust so I sanded, primed, painted and clear coated them using the paint pens. I highly recommend all Sprinter owners check their van for rock damage early and often so rock damage can be fixed before rust gets out of hand.